Since February 1st, the fragrant aroma of coffee  fills rue Saint Sabin in the Bastille area of Paris. 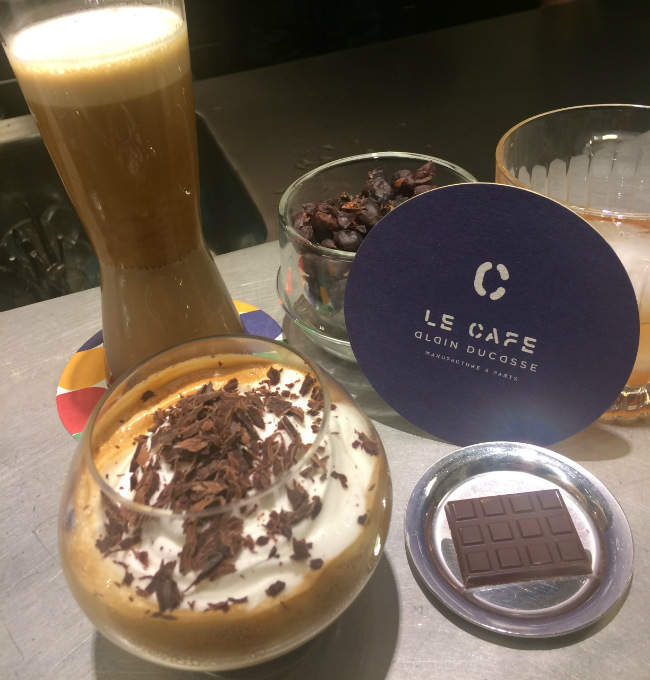 Welcome to the Manufacture de Café by Alain Ducasse. 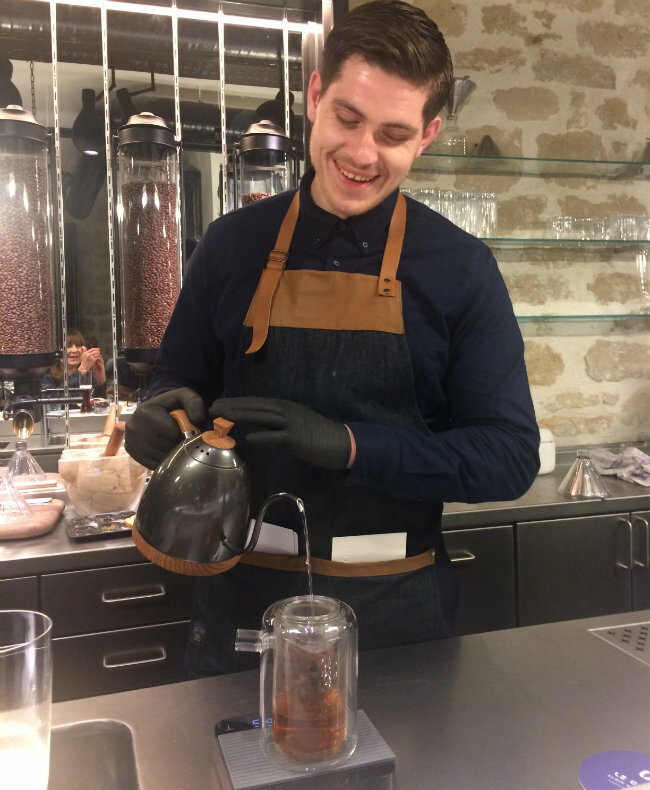 No baristas here – meet the “cafeliers/cafelierès,” men and women who multi-task the rituals of coffee making, coffee language and the art of service, just like a maître d’hôtel. 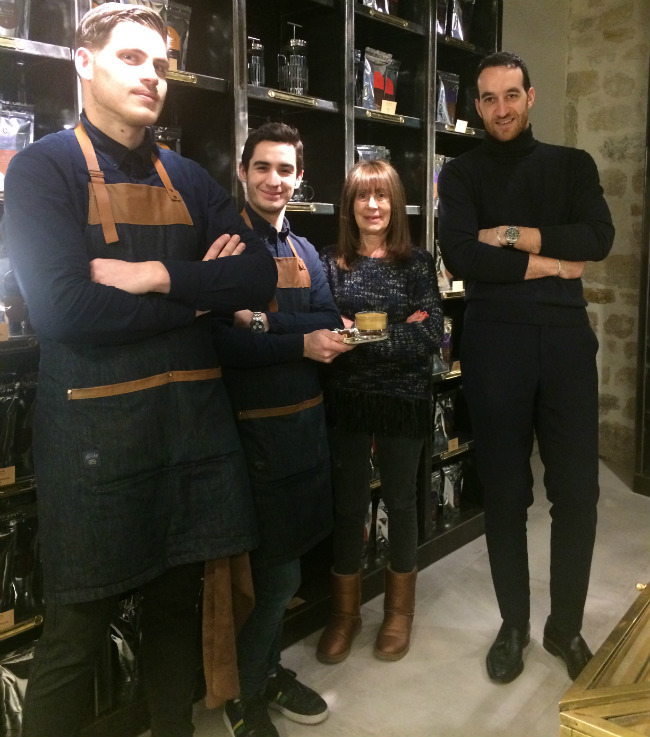 “Our ambition is to build a brand of excellence – each link is important – from the producer to the cafelier/ cafelierè who hands you your cup/glass of coffee,” explain the passionate Manufacture team Olivier, Tom & Brice. They’ll happily talk coffee all day. At present eight varieties are available: Yemen, Ethiopia, Kenya, Panama, Costa Rica and France, as well as two exclusive blends to be tasted on the spot or to go (sassy blue cardboard mugs) in grains or ground. The dreamy, creamy, cappuccino recipes use raw Normandy whole milk, almond milk or hazelnut reduction. Add Cascara de Mil Cumbres – infused skin and pulp of the coffee berry – a soothing hot bevvie – or – refreshing cold, infused for 24 hours, then filtered, more reminiscent of tea than the little black! Nibble warm Madeleines (€3 – for 5), perch at the long bar or in the window, and watch the world go by. Yemen’s priced at an eye-watering €15! The reason? “The rarity of the raw beans, from the highlands, in a country at war that produces only about 20 kilos per year, and the quality of the cup, bien sûr,” shrugs Olivier. In homage to the first coffee houses (dating from 1683), there’s Viennese coffee (€5) double espresso – unsweetened- topped with raw milk cream, a puff of nitrogen, sprinkled with grated chocolate shavings. There’s also Ethiopian, brewed cold for 24 hours, served “like beer” (€6) – subtle and refreshing. 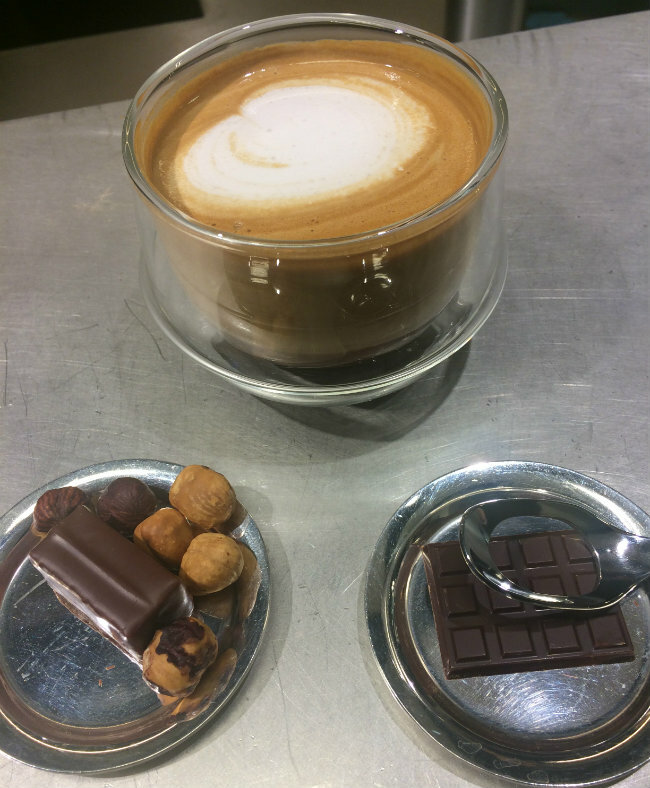 Each drink has its own container and is accompanied by chocolate chosen according to the recipe (hazelnut praline for hazelnut milk cappuccino, for example). No decaf on the menu for now. “I haven’t found the right one yet, but I am working on it!” says Veda Veraswami. 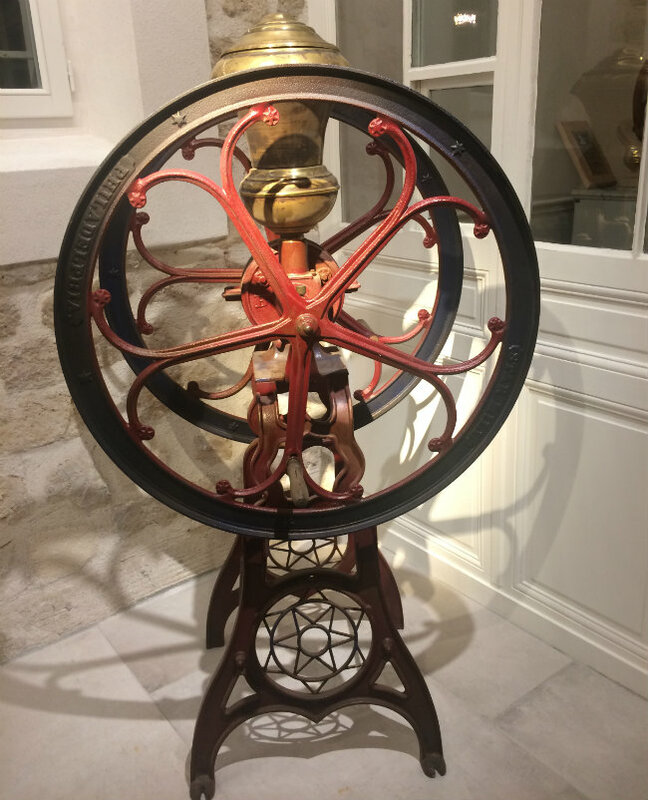 For the décor, Alain Ducasse collaborated with Patrick Laforgue to create the neo-industrial atmosphere, similar to the Manufacture de Chocolat, on which the two men worked together. Quirky decorative elements were sourced by Monsieur Ducasse, on his travels and in Paris, adapted to their new functions: the 19th century brass shop window, custom built steel shelves originally from the Banque de France, two 1930s double doors signed by artisan ironworker Raymond Subes. And, the cart used to carry the bags of raw coffee was originally used for gold bullion! 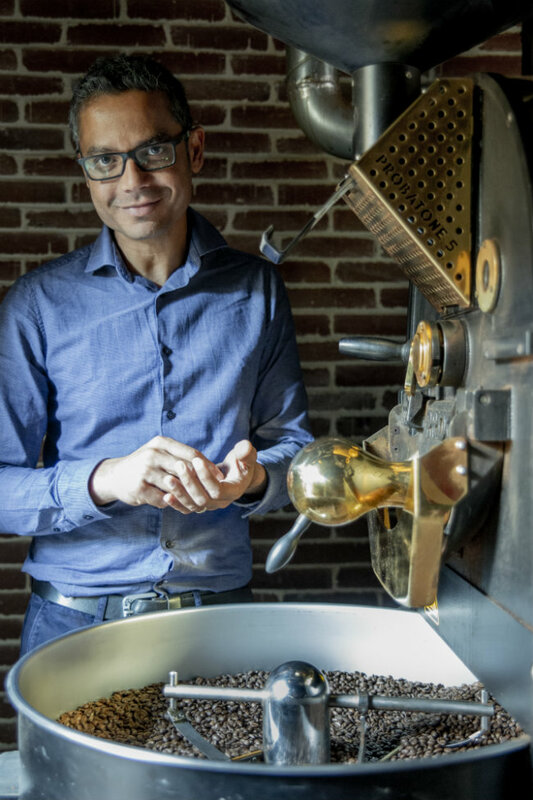 Look out for coffee from Manufacture in restaurants near you – and in all Alain Ducasse establishments!